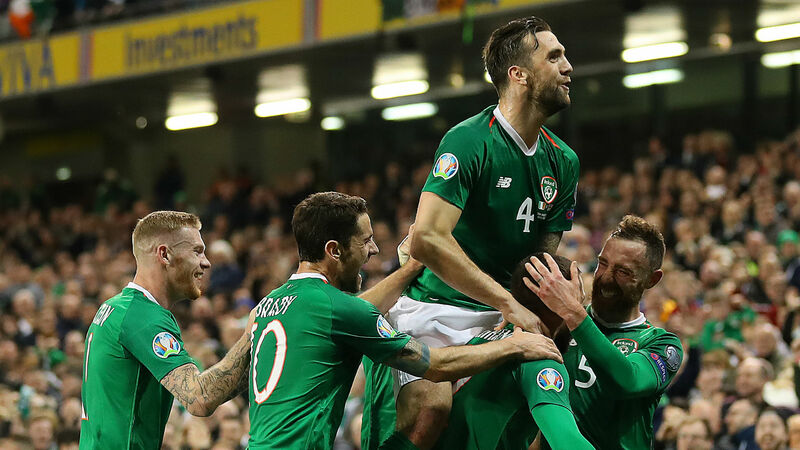 Mick McCarthy's winning start to his second spell in charge of the Republic of Ireland continued as Conor Hourihane's free-kick earned them a 1-0 Euro 2020 qualifying win over Georgia. Aston Villa midfielder Hourihane's exquisite effort – Ireland's first goal on home soil in four matches – ensured McCarthy's side made it two wins from two in the campaign. Hourihane's maiden international goal was the least Ireland deserved on McCarthy's Dublin return, with Jeff Hendrick having an effort disallowed for offside in the second half - though they were ultimately fortunate to survive when Jaba Kankava's late effort from range struck a post. The victory lifted Ireland onto six points from their opening two Group D fixtures, and they sit top, ahead of favourites Switzerland after they drew 3-3 with Denmark. Hourihane would have capped a bright Ireland start if not for a fine save by Giorgi Loria, while David McGoldrick drilled wide. A reported fan protest against the FAI looked to have been avoided, but play had to be paused just after the half-hour mark when tennis balls were thrown onto the pitch. But the fans' frustration soon turned to delight – Hourihane picking out the left-hand corner with a pinpoint strike immediately after play had restarted. Hendrick thought he had doubled Ireland's advantage 13 minutes into the second half, only for the offside flag to cut his celebrations short. McGoldrick looked set to wrap the win up soon after, but having rounded Loria, he failed to keep the ball in play. Ireland were almost made to pay for their profligacy with five minutes remaining, the post coming to their rescue from Kankava's wicked long-range strike. Ireland had grown stale under previous boss Martin O'Neill and his assistant Roy Keane, and while McCarthy is not a long-term appointment – he is set to be replaced by Stephen Kenny after Euro 2020 – he managed to get a tune out of his side on Tuesday following an unconvincing display in the win over Gibraltar. The Aston Villa midfielder has always been capable of the spectacular, but up until Tuesday had not managed to bring his goal-scoring exploits to the international stage. He marked his first Ireland goal in some fashion to cap an impressive individual performance. Vladimir Weiss set up his Georgia side to frustrate their hosts, and while they were solid enough, a lack of attacking intent – or quality – meant Ireland's defence had little cause for concern until Kankava's thunderous effort late on. - Ireland have won now each of their six home meetings with Georgia by an aggregate score of 11-1. - McCarthy's side are unbeaten in each of their 10 matches with Georgia in all competitions (W9 D1), their joint-longest unbeaten run against a single opponent along with Turkey (10 between 1974 and 2003). - Ireland have won their opening two matches of a major qualifying campaign for the first time since the Euro 2016 qualifiers, when they also beat Georgia and Gibraltar in their first two matches. - They have recorded four consecutive clean sheets in all competitions for the first time since a run of eight between May and October 2011. - McCarthy has now won his first two competitive matches in charge of the nation in both stints as manager, also claiming victory over Liechtenstein and Macedonia back in 1996. Denmark featured in the Republic of Ireland's Nations League group, and they are their next opponents in qualifying. Georgia, meanwhile, host Gibraltar.